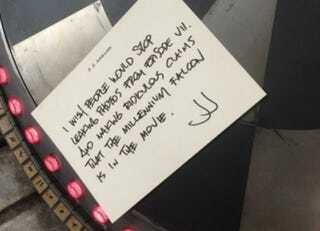 J.J. Abrams addresses the Millennuim Falcon rumors in the best way possible — by outright denying them in a note placed a top a certain holochess set. Wait a minute ,you!!!! I wish people would stop leaking photos from Episode VII. And making ridiculous claims that the Millennium Falcon is in the movie. - JJ. Of course this note is photographed on top of the famous holochess set from inside said Millennium Falcon (pictured below). Hey, we're not saying there aren't other holochess sets a long time ago in a galaxy far, far away. But obviously, yeah this is cute. Classic JJ. So there you have it. Get excited, people.